American cuisine in a contemporary-rustic setting. Breakfast buffet daily, Lunch Mon.-Fri., Dinner Mon.-Sat. 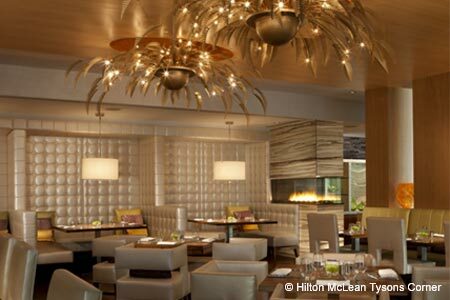 : The Hilton McLean Tysons Corner’s restaurant boasts a rustic-contemporary setting. Dazzling glass-encased fireplaces spurt up jets of flames; all-natural wood colors are accented by shiny marble-topped tables; the verdant verandah appears from every window angle; and the hotel is establishing its own community farmers market. Executive chef Luc Dendievel has even set up several garden plots. At lunchtime, consider the thick and juicy burger with strips of smoky bacon; you can even request the bacon jam as an accent. Whether for lunch or dinner, check out one of the freshly made flatbreads --- the open flatbread station is at the front of the restaurant; for a real treat, try the ancho chili barbecue shrimp. Throwing calorie caution to the wind, dinnertime musts are the duo of pork tenderloin and braised pork cheek. And for dessert, hope that the butterscotch pudding served with cubed house-made pound cake, all bathed in a salted caramel sauce and topped with whipped cream, is available. Housing the wine collection is a glass-wall wine "vault" near the entrance.